The Talend Exchange allows the Talend community to share items related to the Talend Open Source products, such as Data Integration, Data Quality and Master Data Management. 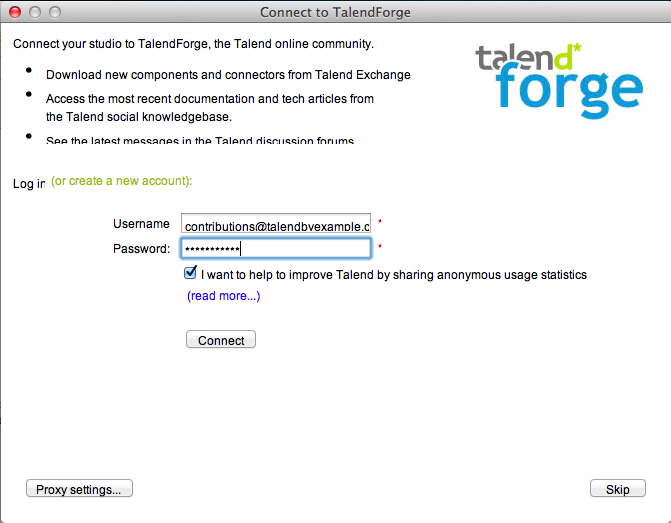 Any Talend user may contribution and no specific validation is required. 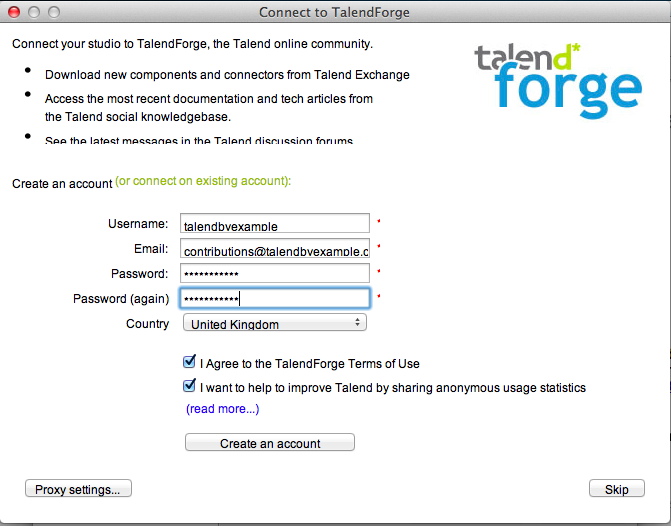 You may create your account within the Talend Design Tool or you can create a Talend Forum account; which automatically gives you a Talend Exchange account. To register or create your Talend Exchange account from within the Talend Design Tool, select Talend Studio->Preferences->Talend->Exchange or Window->Preferences->Talend->Exchange. If your account is not already registered or you have not created it yet, you can do so here. The following screen shows an unregistered account. Press Sign-in to either sign-in with your existing account or to create a new one. If you already have an Exchange Account, select (or connect on existing account): as shown in the screenshot above. This will then allow you to enter your Exchange Account details as shown below. You may, optionally, elect to provide anonymous usage statistics. Press Connect when you have entered your details. Once connected, the preference dialog screen should look similar to the one shown below. If you would like to be automatically advised when updated extensions are available, select Notify me when updated extensions are available. 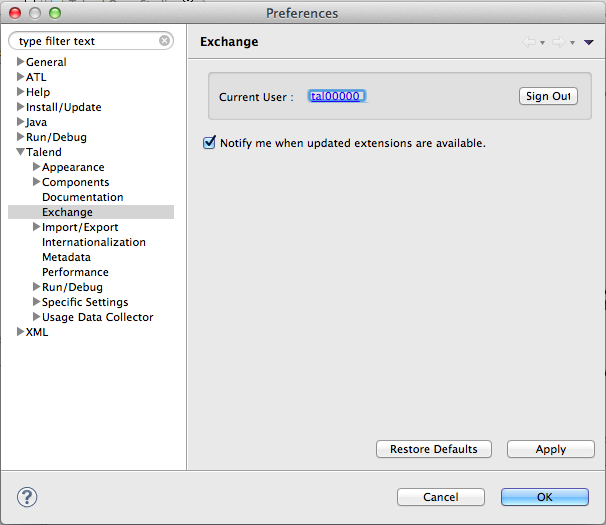 Press Ok to view available extensions. 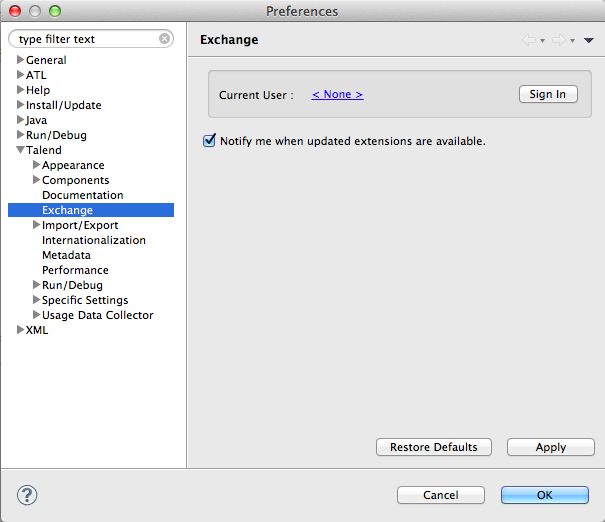 You will now be presented with the Extensions dialog showing the Available Extensions. From here, you may view or download extensions. Additional tabs are available for accessing Downloaded Extensions or My Extensions.